An article written on these pages about Peter Sutcliffe – The Yorkshire Ripper drew a negative response from one reader who shared with the subject an 8th house stellium. 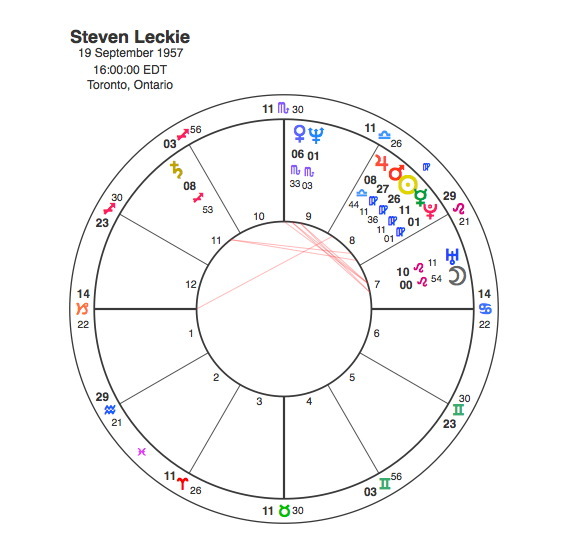 This reader admonished Capricorn Research for suggesting anyone with such a chart would inevitably be a serial killer. This notion is absurd and betrayed more than anything that the person concerned had not even read the article beyond the headline. This reaction is one of rather extreme paranoia but it is also simply an exaggerated version of something that so frustrates this writer. Billions of people follow astrology on some level or another but very few of them are genuinely interested in the subject itself. People simply want to see it in terms of what it means to them. They want to know whats going to happen in their chart, but beyond that nothing really. Its understandable human nature, Capricorn Research was the same at the beginning but once a decent self understanding was acquired through astrology, I was addicted to the subject to the point that I had to find out what made everyone else tick as well. The reader of the Sutcliffe article got hold of the wrong end of the stick and tried to bash me over the head with it. One effect of his reaction is that I now feel obliged to write a kind of covering note whenever I do charts of serious baddies, saying that just because one person with X in Y sign does this it doesn’t mean that everyone who has it will do the same. I have been on the lookout for an article about the 8th house that might persuade people of a lack of prejudice on my part, so hopefully this one will contribute to redress any perceived imbalance. Honore Daumier was an innovative 19th Century painter and sculptor, but he was most widely known for his satirical cartoons which ridiculed pompous lawyers and the hypocritical bourgeoisie. With the Sun, Moon, Mars and Pluto in conjunction in the 8th house, we could be forgiven for expecting another Sutcliffe. Daumier was certainly aggressive and extremely sharp in dishing out his attacks. But of course the whole stellium is in Pisces so its unlikely to be expressed through direct physical violence. Satire as an art form has incredible power to undermine preconceptions in an indirect way. This is how Pisces attacks its targets. Daumier’s acid pen quickly earned him a notoriety that was not without its downside. His 1831 engraving of the bourgeois King Louis Philippe in the guise of an enormous glutton with a pear-shaped head–which became the caricaturist’s shorthand for the pudgy monarch, landed Daumier in prison for six months. Like many people with Pluto aspecting the Sun and Moon at birth, Daumier did not live long enough to experience a major transit of the planet, but his experience in prison coincided with Saturn being in Virgo opposite his 8th house stellium. Undeterred by this experience, he followed up by heaping scorn on the entire government with a collection of clay busts. These were portraits of politicians and magistrates, pompous asses with ravenous mouths, bulbous noses, triple chins, ruthless and mean spirited. Daumier’s political protest is evident through his paintings. He powerfully depicts the cold-blooded massacre of poor, innocent dwellers by troops called out to quell an uprising. He also portrays insurgency with workers, arms raised in protest and sketches of immigrants fleeing some invisible catastrophe or misery. Well all Capricorn Research can say is it takes one to know one. Charles Baudelaire was a poet and one of the major innovators in French literature. His works show the rejection of the belief in the supremacy of nature and the fundamental goodness of man as typically espoused by the romantics in favor of a new urban sensibility, an awareness of individual moral complexity, an interest in vice, decadence and sensual and aesthetically pleasures. He is credited with coining the term “modernity” to designate the fleeting, ephemeral experience of life in an urban metropolis, and the responsibility art has to capture that experience. In many ways he is a much more classic 8th house stellium character than Daumier. But then again his planets were in Aries, a much more directly assertive and self centred sign. His Sun’s conjunction with Saturn showed a liking for the dark side and an Arien 8th house tendency to explore it in depth, come what may. It is alleged that Baudelaire advocated satanism, he certainly experienced drug altering states of mind. 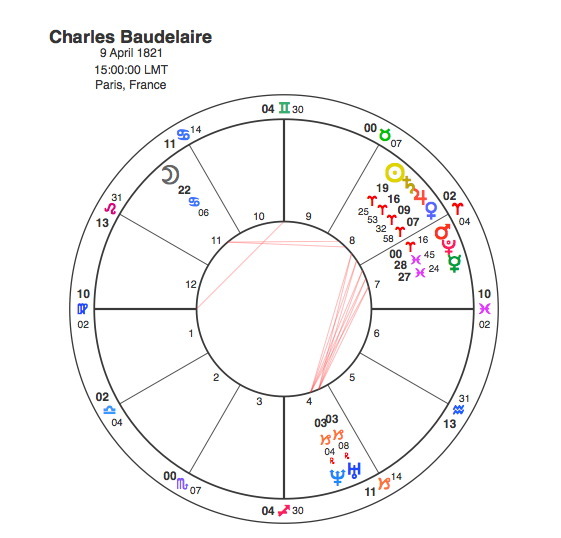 The turning point in Baudelaire’s life was probably Pluto’s conjunction to his Sun between 1840 and 42. Up to this point Baudelaire was erratic in his studies and prone to idleness. During this period he began to frequent prostitutes and may have contracted gonorrhea and syphilis and he began to run up debts. His stepfather sent him on a voyage to India, in 1841 in the hope of ending his dissolute habits. The trip provided strong impressions of the sea, sailing, and exotic ports, that he later employed in his poetry. When he returned he began to compose some of the poems of “Les Fleurs du Mal”. Many of Baudelaire’s philosophical proclamations were considered scandalous and intentionally provocative in his time. He wrote on a wide range of subjects, drawing criticism and outrage from many quarters. But what else would we expect from someone with a stellium in Aries in the 8th house ? Another artist with an 8th house stellium although from a very different milieu was fashion designer Coco Chanel. Her impact was extraordinary and she was on Time magazine’s list of the 100 most influential people of the 20th century. Chanel was raised by nuns who taught her how to sew. During her brief career as a singer, she was called “Coco.” a shortened version of cocotte, the French word for ‘kept woman. She certainly used her romantic relationships to further her career. Chanel became involved with Etienne Balsan who offered to help her start a millinery business in Paris but soon left him for one of his even wealthier friends, Arthur “Boy” Capel. She launched her perfume, Chanel No. 5, which was the first to feature a designer’s name. In 1925, she introduced the now legendary Chanel suit with collarless jacket and well-fitted skirt. Her designs were revolutionary for the time and she helped women say good-bye to the days of corsets and other confining garments. Her love life did get her into difficulty however as during the occupation of France, Chanel got involved with a German military officer, Hans Gunther von Dincklage. She was not charged as a collaborator at the end of the war which some people believe was because of her influence with Winston Churchill.Chanel suffered in the court of public opinion and her relationship with a Nazi officer was viewed as a betrayal of her country.Her affairs were always likely to get her into trouble as result of her T Square between Mercury in the 8th, her Moon in Pisces and an apex Saturn in the 5th house. Uranus’ transit to square all her 8th house planets as well as her Moon occurred between 1940 and 45. Coco Chanel also had a Sun / Pluto square aspect. This will always show someone who will go through profound changes in her life with a great capacity for reinvention. So it proved when at over seventy years old, after a fifteen-year absence, she felt the time was right for her to re-enter the fashion world. The re-establishment of her couture house in 1954 was applauded by the British and Americans, who became her faithful customers. Pluto was conjunct her Sun from 1954 – 56. 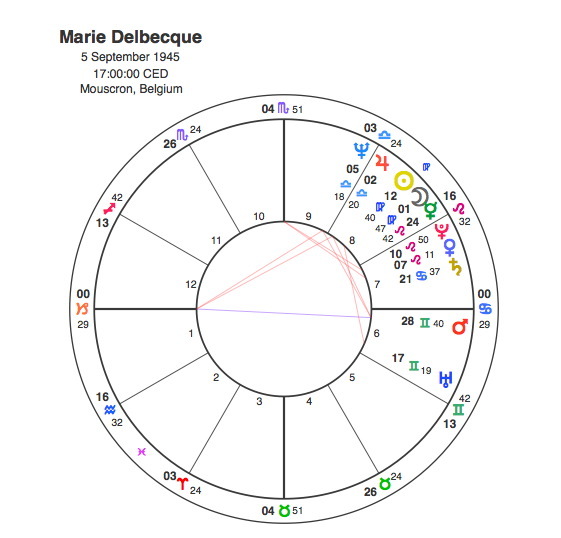 Coco Chanel was another 8th house artistic revolutionary but the Sun’s conjunction with Venus in Leo showed her impact would be in the showy world of fashion. The only information I have on her is that she was a French artist in stained glass. She also has a remarkable distinction in being an authentic and medically documented case of hermaphrodism. An artistic revolutionary of a different sort. Rory Bruce Hayes was an American artist who was one of the 1960 “acid” cartoonists. His work was primarily passed around in the limited publications of the drug set. 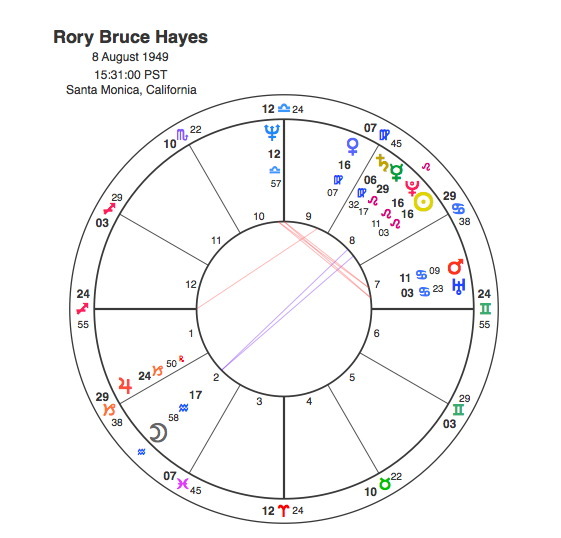 Hayes was a revolutionary as indicated by the Sun conjunct Pluto as part of his stellium. The involvement with drugs would be indicated by the sextile to an elevated Neptune exactly conjunct the Midheaven. Steven Leckie was an artist of sorts. He was a Canadian punk rocker going by the name of Nazi Dog, the lead singer of the Viletones. Leckie was almost universally hated by his peers, and portrayed as a manipulative opportunist constantly cutting himself with bottles onstage. This abuse was shown in his self portraits which seems very fitting for someone with the Sun conjunct Mars and Mercury conjunct Pluto all in Virgo in the 8th. So all 8th house people do not go round bumping people off, if they did the rest of us would all have to become policemen to stop them. But the whole point of a stellium is to put extra amounts of energy into one’s chosen field and all of these artists lived lives of great intensity. As with all stelliums much depends on the signs and planets involved. Maybe even Peter Sutcliffe could be seen as someone who turned the murder of prostitutes into a kind of art form, the kind that comes from a Mars / Pluto conjunction and an exact Moon / Saturn one in Cancer. Hopefully this article serves as a more realistic appraisal of the gifts and character of tenants of this house. Just so long as nobody with an 8th house stellium writes in saying I am accusing them of being a dead foreign artist. So I would say you have a Venus / Mars conjunction in the 8th with the Sun in the 9th. But many astrologers use different ways of working so who knows ? Trust in the fact that most serial killers have mutable energy in abundance in their chart and serial killing does not point to the 8th house.